You can load envelopes in Cassette 2 (lower cassette) as described here. You can print on plain paper envelopes in this size: No. 10 (4.1 × 9.5 inches [105 × 241 mm]). 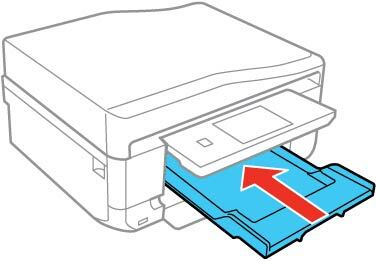 You can also load a single envelope in the rear paper feed slot, as described in that section. Note: Do not remove or insert the paper cassette during printing. Raise the control panel, if necessary. 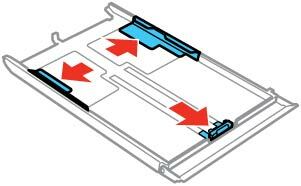 Close the output tray by pressing the open/close output tray button or by hand, if necessary. Open the front cover and pull it out to remove the lower cassette. Slide the edge guides outward. 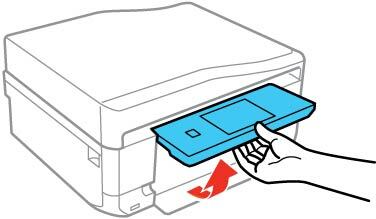 Insert up to 10 envelopes, printable side facedown and flap edge left, as shown. Note: Make sure the envelopes are not sticking out from the end of the cassette. Slide the edge guides against the envelopes, but not too tightly. Note: Make sure the envelopes are under the tabs on the edge guides. Keep the cassette flat as you insert it. If prompted by the product's LCD screen, select Envelope #10 for the Paper Size and Envelope for the Paper Type, and select Done. 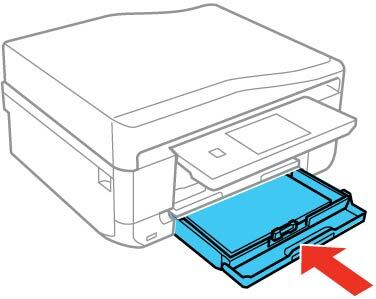 Note: The output tray opens automatically when you print. If you have trouble loading a stack of envelopes, press each envelope flat before loading it or load one envelope at a time. 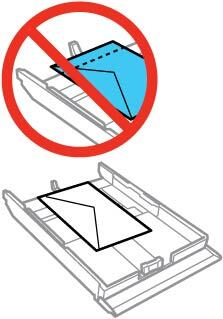 Do not load envelopes that are curled, folded, or too thin.